Your home is not only your castle, but it is also often your biggest investment. So if you had a chance to not only upgrade this asset but to do it in a way with no upfront cost it would be an ideal investment right? Sounds too good t be true? Luckily it isn’t. 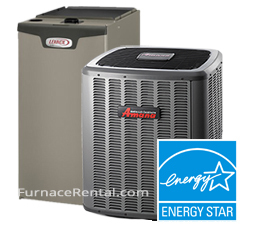 You can not only upgrade your heating system without any upfront costs, but you can actually save yourself money each month choosing to rent your next high efficiency furnace. Why would you rent? Well other than the obvious perk of keeping thousands of dollars in your own pocket, renting rather than purchasing has many other benefits. A predictable cost – by spreading out the cost of a new heating unit into a monthly fee rather than a large initial outlay, home or business owners are better able to build a predictable annual budget. Business owners are able to build the fee into their budget and property owners can include the cost in their tenant’s monthly rental fee. Keep your furnace running as efficiently as possible – Many choose to upgrade for the potential energy savings but if you don’t maintain your furnace you won’t maintain your savings. But many can’t afford to have a service technician maintain their unit on a regular basis. Failure to perform regular inspections can result in a less efficient unit. With a rental agreement, your maintenance is included in your monthly fee. Peace of mind – For most property owners, the breakdown of their heating or cooling unit results in a huge financial downfall. Not only are they on the hook for the cost of the repair, but they also have to face a possible loss of man hours to try and find quotes and arrange a repair. In contrast to get service for a rented furnace simply requires a simple phone call to our 24/7 emergency line. No money upfront but cash in hand – By choosing to rent you still qualify for any government rebates offered in your area. While the rebates vary by province, in Ontario you can qualify for up to $250 when upgrading an older heating unit for a high efficiency system with an an Electronically Commutated Motor (ECM). A high efficiency gas furnace is an attractive addition for any home and a great way to add resale value without dipping into your savings account. By calling for a new high efficiency furnace rental, you can have a licensed technician in your home as early as the next day. With our free installation, a licensed technician will come to your home and install your new high efficiency unit for free including up to 15 feet of duct work. We can also remove your old unit at no additional charge. Not every home is set up for a new gas furnace. The biggest question an HVAC professional will likely ask when you are considering a conversion is how much will it cost? Costs vary widely depending on which system you currently have in place and whether ducts will need to be run or modified in order to accommodate a gas furnace. Even with conversion costs, you can save money by switching. Considering the high costs of electricity, savings compounded over time can still make a conversion a great option. Consider the example of a single detached home living east of Toronto between 1000 and 1500 sq feet built around 30 years ago. According to Enbridge Gas, this typical home, with three bedrooms, 1.5 bathrooms, a 30 gallon water tank and housing a family of five would benefit substantially from upgrading to a high efficiency gas furnace. It should be understood that the above table is using the higher end of the average monthly cost ($60-$85). Major gas Canadian gas suppliers have been increasing their service areas so that even more Canadians have access to save on their energy bills. Union Gas: over 100 years of experience and over 1.4 million customers. Check out their coverage map here. Enbridge Gas: Canada’s largest natural gas distributor with over 160 years of experience. They opened their first store in 1908 on Adelaide st. In Toronto. Check out their coverage map here. Manitoba Hydro: The major power utility for Manitoba, Manitoba Hydro is a Crown Corporation serving over 276,000 natural gas customers as well as providing electricity to an additional 560,000. To find out if there is service in your area check their service area here. ATCO Gas: Alberta’s largest supplier of natural gas, ATCO services over 1.1 million customers in nearly 300 communities. Curious whether you can have natural gas in your area? Contact ATCO here. Alta Gas: utilities delivers natural gas to over 7200 residential, rural and commercial customers across 90 communities across Alberta. ENMAX: The ENMAX group of companies works together to bring power to over 900,000 metered sites across Alberta. Find out of you can connect service in your area. SaskEnergy: A provincial crown corporation with more than 50 years of experience in Saskatchewan. Inquire here to see if service is available in your area. Connect Energy: A Saskatchewan-owned natural gas distributor that supplies over 6000 customer locations across the province. Fortis BC- Delivering over 21 per cent of the province’s energy, Fortis BC serves over 1.1 million customers in 135 communities. Check out their service area. Direct Energy: Direct Energy serves nearly five million customers across North America.